The varied catalog of memorable Riverside albums by Thelonious Monk includes two solo-piano efforts. Producer Orrin Keepnews remembers them as equally successful but strikingly different projects. 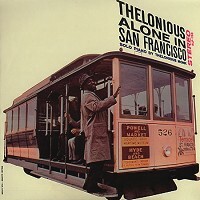 The 1957 Thelonious Himself was recorded in New York on three separate nights and involved much creative ferment and many re-takes. This album was accomplished with remarkable ease in Northern California two years later, in two brief sessions on consecutive afternoons (one preceded by lunch at a family-style Italian restaurant), with only one of the ten selections (a totally unfamiliar old pop tune arbitrarily chosen at the last moment) requiring more than one take. Customer Reviews (4.50 Stars) 4 person(s) rated this product. This is truly an outstanding album, & cut at 45 RPM, nothing can be better, except being in the studio at the time of the original recording. I plan to buy more of this series.